In case you forgot, I'm using outfits I found on Pinterest as inspiration these next few weeks. Here is this week's inspiration. I love the classic look of the button up and sweater paired with the trendy mint skinnies. What? I'm drawn to a button up and a sweater? You're shocked, I know. I tried to break down what I liked best about the Pinterest outfit and bring it into my version in a way that fit my 'Classic Pretty' style statement. Here is my interpretation. I love the mix of neutral with the mint skinnies and blue top. I also love the polka dots in the Pinterest outfit, but I don't have one similar, so I went with a solid oatmeal colored sweater instead. I think the polka dots look better, but I like my version, too. Another thing I like about the Pinterest outfit is the necklace detail. Mine is a different style, but it fits me and what I like to wear. I also chose heels instead of flats because I really need all the help I can get in the height department. Overall I like the look, but I definitely think the Pinterest outfit is more interesting. Mine is a tad blah. However, it was fun looking at what I already had in my closet and trying to make it work. What do you think? 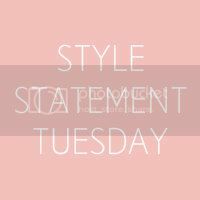 Link up and share your style! I'm also linking up here, here, and here. Cute outfit. I love that necklace. It is so pretty and delicate looking! Oh I like the necklace and your outfit is perfect for transitioning into spring! I love the inspiration photo and how you created the look! So pretty! I love this!!! The mint pants are amazing. I'm jealous, it's still so cold here! I just found you blog through the link up! Your outfit is adorable!! Can't wait to read more!! Super cute look! Kind of obsessed with that necklace!! So pretty and I love your description of "classic pretty". Very pretty! Maybe next time add a bubble necklace to kind of mimic the polka dot detail on the other sweater? Just a thought! Very pretty combo! The necklace is really delicate.